Card games are awesome. The depth and complexity two decks of cards can provide players is amazing. 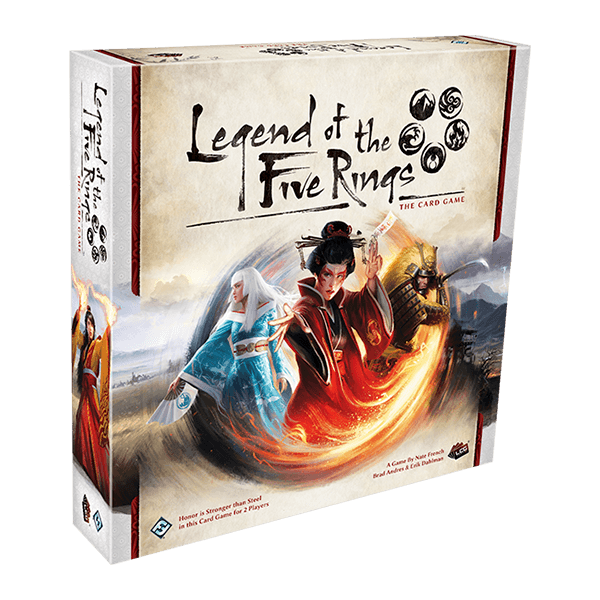 Legend of the Five Rings by Fantasy Flight is the best living proof of just that- the undeniably awesome potential of a card game. 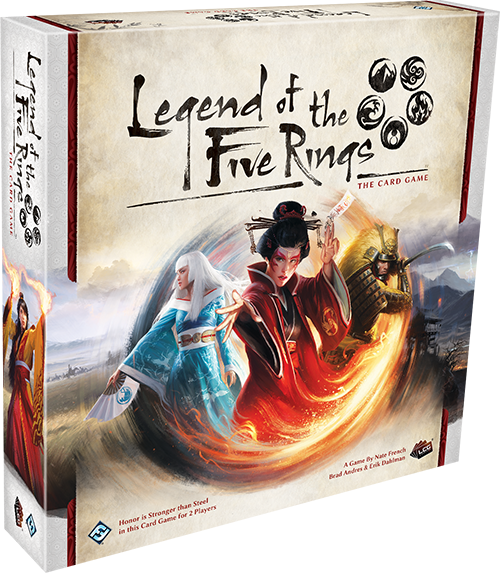 Legend of the Five Rings (L5R) is Fantasy Flight Games’ newest title in their Living Card Game line. 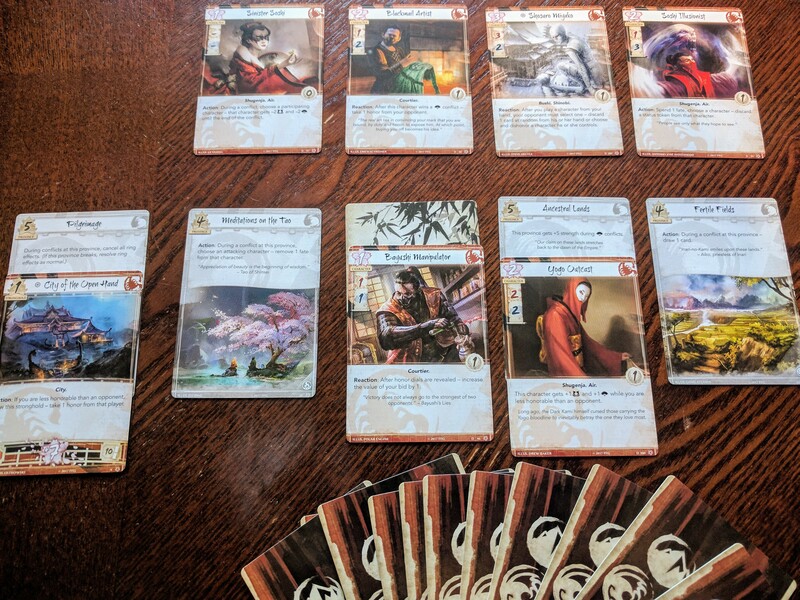 If you’ve played a Collectible Card Game (CCGs) such as Magic the Gathering, Pokemon Trading Card Game, Yu-Gi-Oh, etc., you will feel right at home with L5R in terms of the genre and the deckbuilding nature. 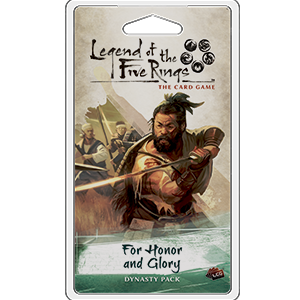 However, as a Living Card Game, every expansion pack beyond the core set for L5R will come with a full play set (three copies) of every card. This model means a much lower cost investment compared to its CCG/TCG relatives if you want to be able to play any deck in the game. Players lead one of the great clans of Rokugan, a sort of mystical world based on feudal Japan. Each of the seven clans plays very different from the others- some are more military-based, while others are more political. Some are honorable, while others engage in underhanded behaviors to become victorious at any cost. Players win the game by breaking their opponents stronghold, gaining 25 honor, or if their opponent loses all honor. 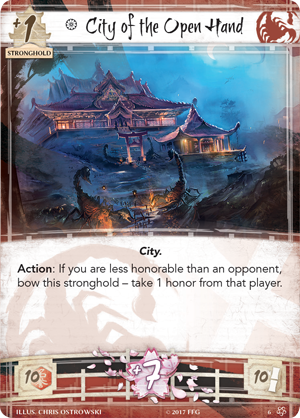 The gameplay of L5R feels very different from other card games as well. A game takes about an hour once players are comfortable with the rules and have learned the cards fairly well. 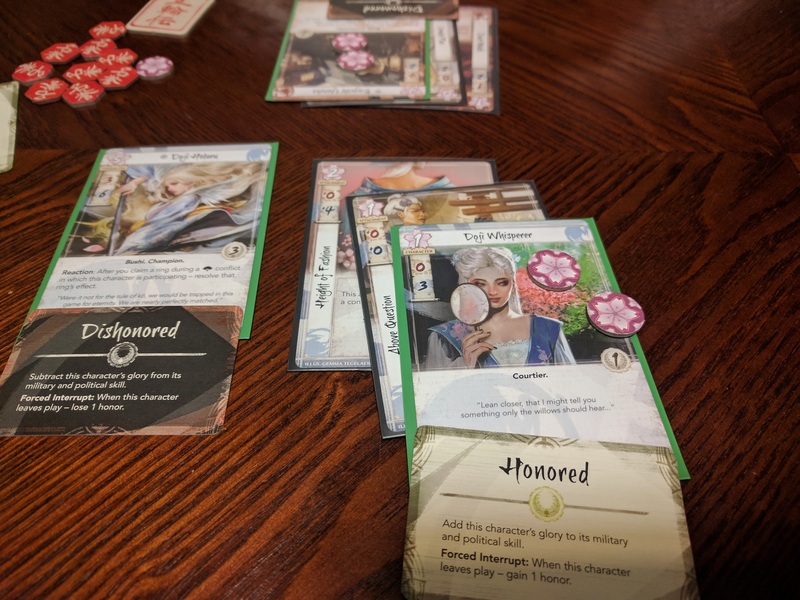 A round of L5R is longer than the average card game in the genre, with play passing back and forth between participants during action windows. If both players consecutively pass, play continues to the next phase. This results in a really smooth feeling of gameplay; rounds can be somewhat lengthy sometimes, but each turn should be very quick. 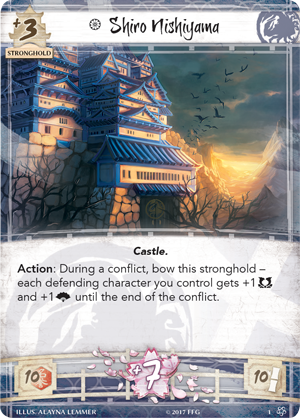 Each of the seven clans in the Core Set come with a stronghold. Each stronghold has a unique ability. Will FFG release more strongholds? We’ll have to wait and see. Characters don’t die from conflict like they do in many other games. Sure, there are some cards and abilities that can cause you to discard a character, such as the popular Assassinate. Instead, characters are played with a number of Fate (the game’s primary resource) on them and one fate is removed each round. When they have zero fate during the Fate phase, they are instead discarded. It’s a very different feel, and it often means if you form your strategy correctly you can keep a powerful character out for a reasonable amount of time. Characters can also bank Fate from turn to turn, giving the game a very economic feel and I’m sure the developers will release nifty ways of generating lots of Fate in the future; more than the handful of cards from the Core Set that function in this manner. The two different numbers you see on the top left of a character card is not Power/Toughness or Attack/Defense, like it is in most games. Instead, most characters can participate in the two types of conflict: Military and Political. Each player can only declare one of each type of conflict per turn, so a balanced approach is usually best. Some clans (looking at you, Lion) are much more Military-based than other clans, such as Phoenix, who are skilled in both Military as well as Political conflicts. 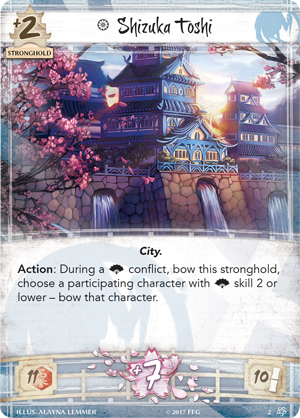 Even aside from conflicts and fate, L5R has many unique features, such as card draw changing from round to round. Each draw phase, players secretly bid a number from one to five. Your bid determines how many cards you draw, with the higher bidder paying the difference in honor to their opponent. Of course, there are cards like Good Omen and Contingency Plan that are affected, or affect your bid. Characters can become honored or dishonored, which usually affect their skill for conflicts, but also gain or lose honor for the controlling player when said character loses play. Also, I don’t know that I’ve even mentioned that each player builds two decks: a Dynasty deck and a Conflict deck. 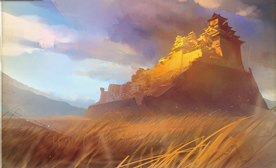 One of the most fascinating aspects of L5R is the player-directed story. 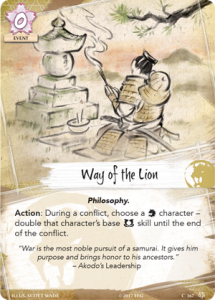 Almost two months ago at the first L5R World Championships, the overall winner of the event chose justice for a prisoner that was given to the Lion clan by a group of Ronin, this affection the future path of the overall storyline of L5R. Fantasy Flight Games also releases all the story related to the card game on its website under “fiction” and I highly recommend checking them out. They are quick reads and contain some interesting short stories. 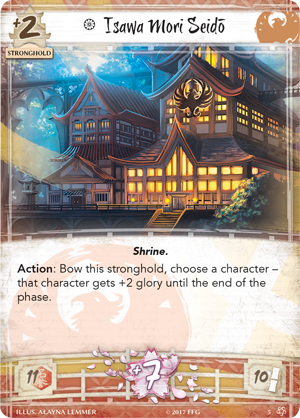 Fantasy Flight will continue to offer up interesting choices to players at premier events, all of which we direct the story of Rokugan in interesting ways. From it’s highly immersive, player-directed story to its depth of game mechanics Legend of the Five Rings is an incredibly unique game. If you’re looking to get into a deep card game and prefer something other than a Collectible Card Game this is absolutely a no-brainer. I ‘m rating Legend of the Five Rings a 9 out of 10 and I’m going to give it a +1 to my rating if you are a couple looking for a customizable/expandable game to play against each other but also compete in tournaments, etc. This game is absolutely perfect for that, because you could share a collection with someone and rarely need to buy multiples of anything beyond the Core Set. 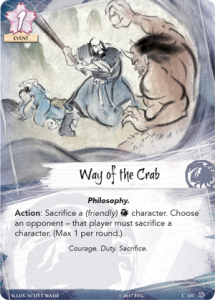 FFG is releasing lots of content for L5R and I’m incredibly excited to see what comes next. Hello everyone! 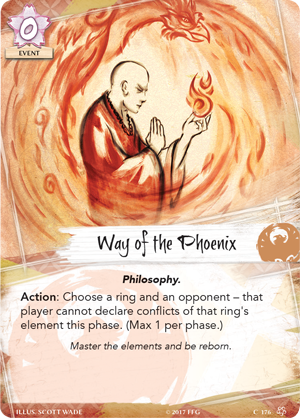 We are still waiting on new spoilers for the Legends of the Five Rings (L5R) so we will be taking a break from the Rising From the Ashes series and talking about how to play the game. We don’t have the complete rule book yet, but from the Learn to Play and L5RLive broadcasts enough to learn is known. 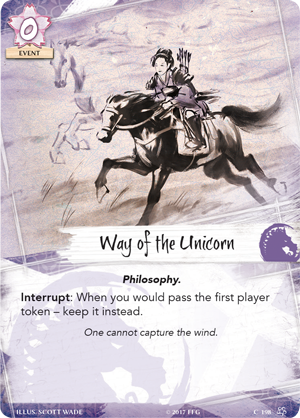 I’ll try to keep references to the original L5R limited, but I’ll be referencing Magic: the Gathering (MtG) since it is the easiest way for me to convey gameplay ideas. 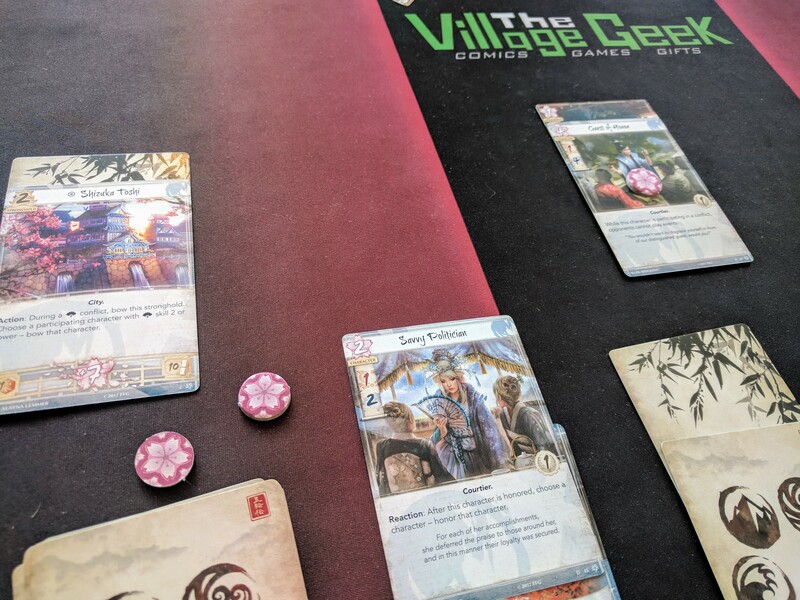 L5R is played with two decks, the Dynasty deck contains Characters and Holdings. Characters are what will be performing all the action during a game and Holdings give you bonuses and abilities to your provinces. 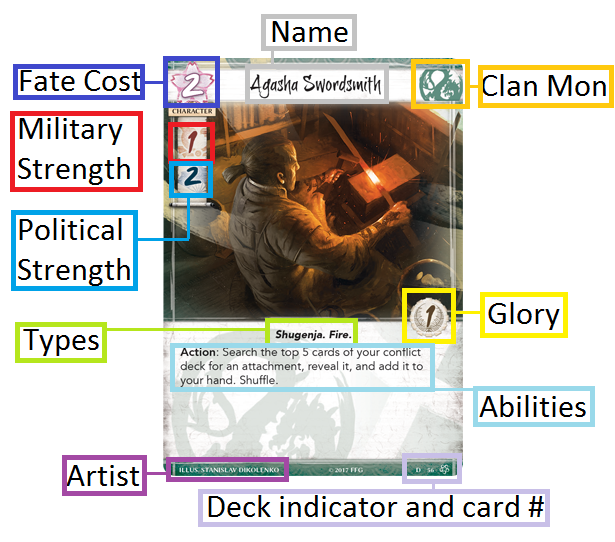 Your Dynasty deck can only contain cards from your clan or neutral cards. The other deck is the Conflict deck and contains Events, Attachments, and Conflict Characters. Events are your interaction cards, similar to instants and sorceries in MtG, Attachments are, you guessed it, attached to your characters, like auras or equipment in MtG, and Conflict Characters are a special type of character that can be played attached to a character or on their own, similar to the bestow mechanic (like Boon Satyr) from MtG. 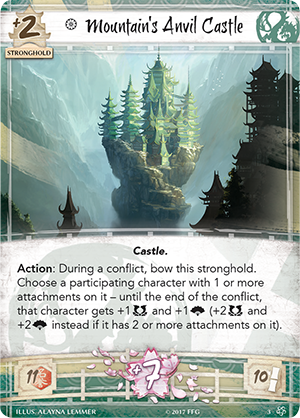 The Conflict deck can contain cards from your clan, neutral cards, and a limited number of cards from one other clan. 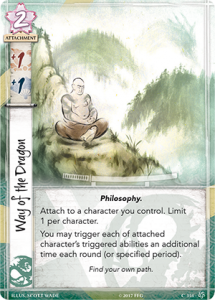 The Conflict deck cards are drawn into your hand while the Dynasty cards fill your provinces. Each player starts with four provinces which they must defend, and attacking their opponent’s is the primary route to victory, break three provinces and their stronghold to win. There are two other ways to win the game, accumulate enough honor (25) that the emperor declares you the victor, or lower your opponent’s honor to zero, shaming them into withdrawing. Since a picture is worth a thousand words here is what a typical set up will look like for a player. Stronghold and Dynasty deck to the left, four provinces, some with cards face up and others face down in this example, the Conflict deck to the right, and the in play area closest to your opponent, with two characters in play. 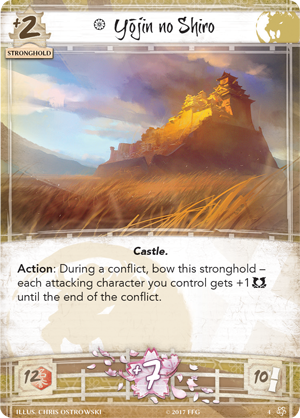 Under the four provinces and the stronghold are hidden province cards, each clan has a unique one and there are many neutral as well. They will have the strength of the province and a special ability, they are revealed the first time a conflict occurs at that province, but we will discuss that more in a bit. First, lets talk about choosing a clan to play, I’ve given a brief rundown of each clan in the previously linked article to give you an idea of playstyle and philosphy, but for now we will focus on Strongholds. Each clan has their own stronghold, right now each clan only has one but I’m sure as expansions come out we will get more, back when I played the CCG, the equivalent of standard had about four stronholds for each clan, each with a slightly different theme of the clan emphasized. The original strongholds were printed on the box the started deck for that clan came in and are therefore frequently refered to as “boxes” (I’ll bow my box to pay….I’ll bow my box to activate…..etc). Anyway here is the Lion Clan’s stronghold with all the parts highlighted and named. Starting at the top we have the province strength, this is added to the province card’s strength hidden under the stronghold at the start of the game. I’m not sure why the strongholds have a unique marker but on character cards it means only one can be in play on your side at a time (legendary in MtG). The clan’s mon is the symbol that would be printed on banners, or their seals etc, and each card will have a clan symbol identifying it. The Lion Clan has one of the highest starting honor at 12, nearly half way to victory, it looks like the game comes with a bunch of hexagonal honor tokens but a die seems way more efficient, especially since honor will always be changing. Fate is the primary resource of the game and each stronghold produces 7 per turn. Fate is used to bring your characters into play, and to play effects during combat or your turn. Fate not spent can be saved between turns, different than most games where your resources reset each turn. The game comes with a bunch of circular fate tokens with the blossom on them but I think a die might be more efficient for your stock and maybe the tokens for your characters, but then even a die for each would work as well. 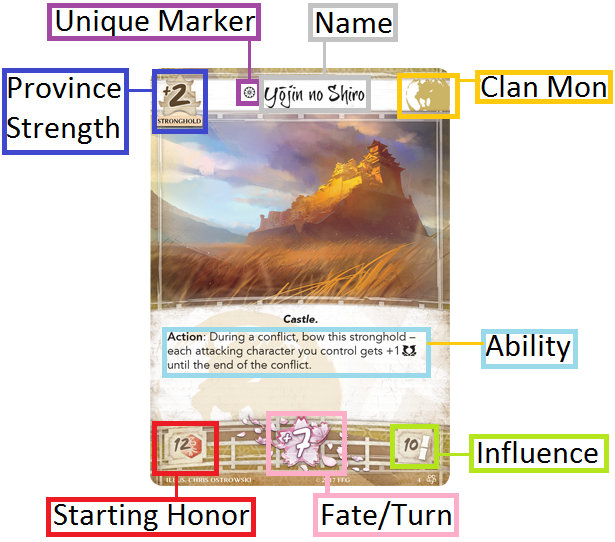 Influence allows you to add cards from one other clan to your conflict deck. Each eligible conflict card will have bamboo symbols to indicate how much influence they require, from spoiled cards so far between one and three is the norm. 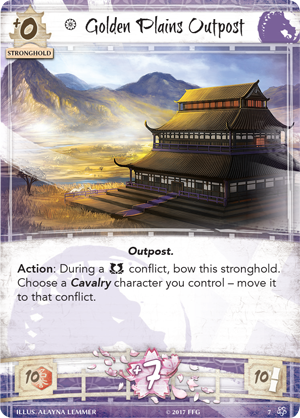 If a conflict card doesn’t show a bamboo symbol it cannot be used in an off-clan deck. The Dynasty phase begins by turning all Dynasty cards in all provinces face up. Then everyone gains fate equal to the amount on their province. 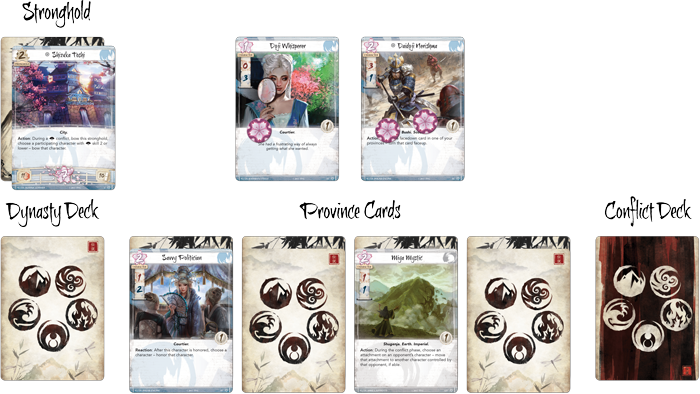 The first player (determined randomly at the start of the game and alternating thereafter) may purchase a card from their provinces or activate an ability, then the other player. The first player to pass gains one fate from the stock and cannot purchase anymore characters this phase. When a Dynasty card leaves a province refill that province face down. You cannot play conflict characters or attachements at this time. 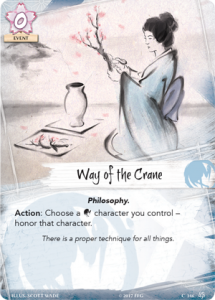 I think now might be the best time to introduce character cards and talk about fate and mono no aware. Mono no aware translates to “the pathos of things” and is a central philosophy in Rokugan, mono no aware is the bittersweet understanding that all things are temporary. This is incorporated in the game by the fate mechanic on the characters. Rather than being defeated in combat and sent to the discard (like the ccg, and nearly every game I’ve played) all characters have the MtG ability fading (as seen on Blastoderm) and will stay around even if defeated. Here is an example of a non-unique dragon character. Again I’ve highlted the different card parts, starting at the top you have the fate cost, this is the base cost to put this card into play from your province. You may then put additional fate tokens from your supply onto the card when purchasing it, giving it additional turns in play before being discarded. The Military and Political strength are used in conflicts, sometimes a character will have a dash rather than a number. A dash means that character cannot participate in conflicts of that type, and if ever they somehow get involved in that type of combat they are bowed and sent home. When a character becomes honored or dishonored their glory stat is added or subtracted to both their Mil and Pol strengths, there is no negative values, but a zero can still participate in a conflict. Anyway back to turn phases. The Draw step is one of the more interesting parts of the game, each player selects a number of cards they want to draw, between one and five, on a secret dial, then the dials are revealed. The player who chose the lowest number gains honor from the other equal to the difference. For example, if I bid 5 (who doesn’t love card draw?) and you bid 2 (You, I guess) I would lose three honor and you would gain three honor. If we both picked the same number no honor is exchanged. After the honor changes hands we both draw cards equal to the number we chose. There is no maximum hand size so honor concerns and tricks are what should guide your bids. The Conflict phase is the meat of the game and deserves its own list, the first player has first opportunity to declare a conflict. Actions Window – Defender has the first action, when both players pass in succession the total strength of the type of conflict is compared and the highest wins the conflict. Passing here doesn’t exclude you from taking an action later in the window, if you are comfortably winning the conflict (or soundly losing and want to conserve your resources) you can pass until an action your opponent takes makes you want to do something. Compare total strength, if the attacker’s is greater than or equal to the defender’s plus the province strength the province is broken. Draws are given to the attacker. Draws with zero strength on each side are true draws with no winner. Resolve ring effects – The winner gets the ring token of the type declared back in step 2. If the attacker is the victor he gets to resolve the ring’s effect (outlined below after turn orders). In a zero strength draw the ring returns to the “unclaimed” pool. Bow (tap…it will always be tap) all participating characters and send them home. Each player may choose each conflict type once per turn, for a maximum of four conflicts per turn, but may also pass their conflicts. If you pass on your first oppourtunity you can choose either conflict type for your second. Once all conflicts are resolved, the Imperial Favor is given to a player. The recipient is determined by the glory of their unbowed characters and the number of rings they have claimed. Then we move to the Fate phase. In the Fate phase each character without any Fate counters is discarded, then each character looses one Fate counter. A fate token is placed on each unclaimed ring. The Regroup phase allows you to discard any face up cards in your provinces that you wish, a broken province’s card must be discarded. Return all claimed rings to the unclaimed pool, unbow (also called ready)(also called untap) each card in play, and the first player token is passed. Then we get to do it all over again. The five rings have a triggered effect after an attacker wins a conflict and they seem to have the ability to make quite an impact on the game, so choose wisely. The air ring allows you to either steal an honor from the defender, or gain two honor. The water ring allows you to unbow a bowed character or bow a character with no fate on them. This takes place before characters are bowed and sent home after a conflict so it doesn’t allow you to give a character vigilance. The fire ring allows the attacker to choose a character and either honor or dishonor them. The earth ring allows the attacker to draw a conflict card and have the defender discard a card at random. The void ring allows the attacker to remove one fate from any character. I had the majority of this article prepared prior to FFG release the official rules documents so I decided to finish it and hopefully give you a slightly easier to digest run through. 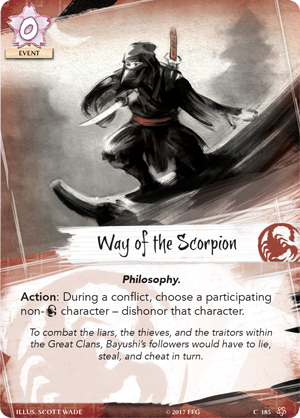 You can find the official document on the L5R product page and it is much more indepth in a lot of areas that I skimmed over for simplicity. There is much more we could discuss but nothing is quite like playing the game to try it out, therefore I have printed off some proxy cards, enough for two decks (Lion and Crane currently) and would love to sit down sometime and help someone learn to play.